Fresh off their 20-13 season-opening win over Estrella Foothills last Friday night, the Maricopa High football team heads to Wickenburg Friday evening for a 7 p.m. kickoff. In Wickenburg the Rams will face a team that is currently ranked second in the state in 3A play. Wickenburg opened play last week with a 34-19 win over Florence. Leading the team this year is senior quarterback Drew Vaughan (son of head coach Norris Vaughan). This is Coach Vaughan’s third year as head coach of the Wranglers (23rd overall as a head coach; from Georgia). Quarterback Vaughan threw for almost 2,000 yards and 24 touchdowns last year as a junior (this is his third year as starting quarterback). He completed 13 of 18 for 153 yards last week; and his primary receiver was senior wide receiver Paul Wells (10 catches for 150 yards). The running game is not quite as potent as it was in the past, but junior tailback Enrique Bernal was impressive last week against Florence (13 carries for 134 yards, including a 46-yard TD run on Wickenburg’s offensive first play of the game). Senior fullback Kellen Henderson (9 carries for 80 yards) also is tough to bring down — carrying the bulk of the running game in the second half last week. Wickenburg’s line is big. Besides all-state tackle junior Blake Crissman, the Wranglers have junior Alex Napoles (6-9, 320) and Mike Miller (6-0, 310) anchoring the offensive line. Henderson also was one of the 3A’s leading tacklers last year as a linebacker. Matt Fierros led the Maricopa attack last weekend with 204 yards rushing on 31 carries. The Rams got two rushing touchdowns from QB Will Clemans, while Davon Snell caught a TD pass from Clemans. 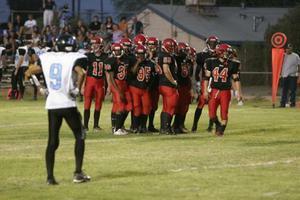 Maricopa returns home next Friday evening for a 7 p.m. contest with Bourgade High.